Our office shredding machine will take too long to shred our cupboard filled with files, so can you help us? Our purpose is to provide an alternative to you wasting valuable time to securely destroy archive documents that clutter up storage space in business, or at home. Paper shredding is not always a priority job in a busy environment with little spare time and before you know it can build and become a major task. Of course we can help whether you require a one-off collection to clear the decks or a regular schedule to ensure you stay in control. Why should businesses clear papers that are more than 7 years old? There is an added incentive for businesses to implement a plan to safely destroy stored information. The General Data Protection Regulation Act (GDPR) 2018 Legislation has criminalised the unnecessary storage of outdated confidential personal information and are issuing Penalty Fines that could be up to 10,000,000 euros or 2% of sales. See the ICO site here. By using Citrus, you can ensure you protect your clients’ data AND stay within the regulations of GDPR. How would Citrus manage large and small collections from offices, warehouses and lofts? At Citrus, we have over 20 years experience and can provide a wide range of solutions to cover all circumstances. 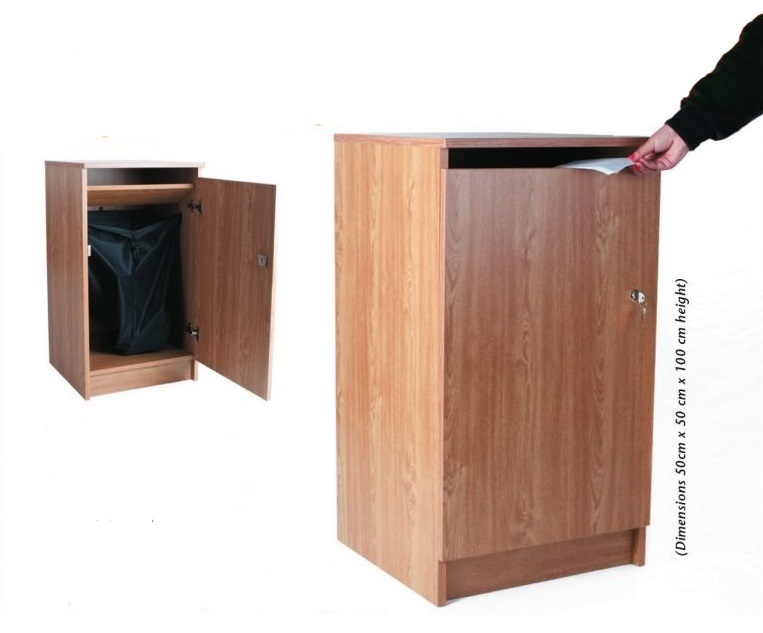 From the provision of strong secure sacks that can be filled and collected on request, to a variety of sizes of confidential paper bins and attractive cabinets that can be included on a regular collection schedule. Whatever your needs, contact us today as we would be pleased to discuss your requirements and work out the right solution for you! Another company has told me to take out staples, clips and coloured paper, but the archives have to be out by the weekend. Can you help? You are in a rush – DON’T PANIC! 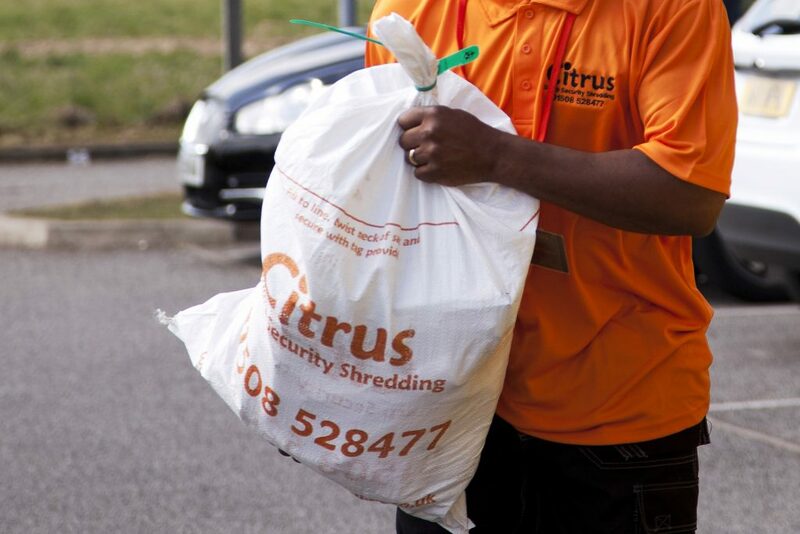 Yes, Citrus accept cardboard divides, files, folders, staples or clips that are removed and separated for 100% recycling in our data shredding facility. Your confidential paperwork will be shredded within 48 hours of collection and once shredded you will receive a Certificate of Destruction. The shredded documents are baled and collected for transportation to a paper mill for complete processing and recycling. Does our Accounts team need a locked confidential paper cabinet in the office? NO, but it would certainly make life easier! We have tried and tested options to suit all offices. Our experienced advisers are happy to help and can arrange delivery of a suitable console immediately. For small offices we can supply you with a tidy and thin 87-litre locking container for all paper and discs. Mid sized offices often opt for a smart ready-made beech veneer cabinet. This locked unit provides almost a square metre of room for storage of accounts and personnel records. For larger offices we offer our exclusive, well designed and smart 120-litre executive locking, wheeled confidential bins. At the end of the day, it is your choice. Whatever your requirements – we have the right solution for you. What level of service will our organization require? Why not request a trial to see what will be the most cost effective solution for your office? 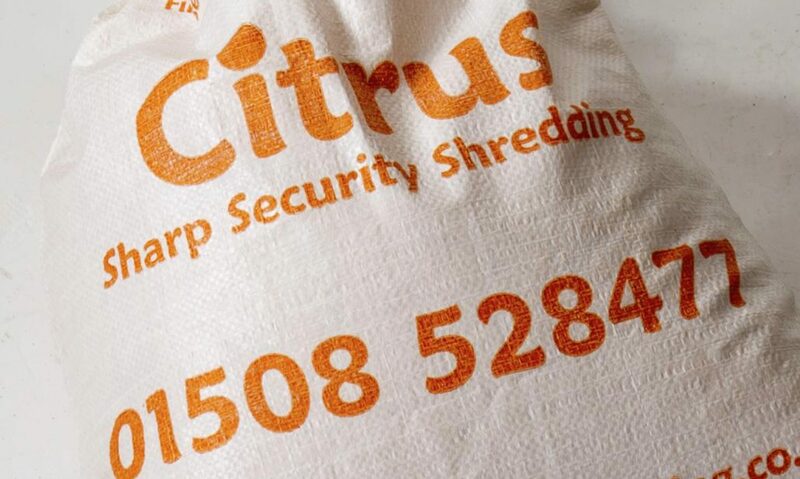 Citrus Security Shredding can provide your business with reliable regular or ad-hoc collection and data shredding service which is completely flexible to meet your needs. 1. Our client-focused approach guarantees you an initial discussion with an expert adviser to plan your individual business or personal shredding needs. 2. We will provide an instant quotation for basic requirements, or if preferred, we can arrange a free visit to your office or home to assess your needs. 3. Once requested, suitable robust confi-sacks, shredding sacks and individually numbered I.D. seals will be provided the following day, subject to availability. We will provide locked cabinets & confi-bins with flexible collection service and multi site offers for businesses. 4. Working in partnership with award winning local recycling experts V.C. Cooke, we can offer a one-stop-shop total recycling and waste management service for all waste types. Click here to visit the V.C. Cooke website.